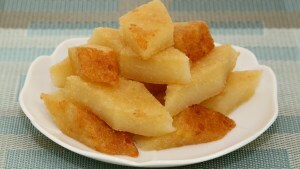 In honor of Mother’s Day, I am sharing my Mom’s simple and delicious recipe for Steamed Banana Cake (Banh Chuoi Hap). If you don’t already know this, my Mom is the amazing person who taught me everything I know about cooking. As a child, I spent countless hours with her being her sous chef. It was in the kitchen that my love for cooking and developing recipes started. To this day, my Mom is still my culinary mentor. We share ideas, swap recipes and always look for ways to re-invent dishes. I had forgotten about this wonderful recipe but on a recent trip home my Mom made this for me. (It’s just like my Mom to always be thinking about me and making my favorite dishes.) Her steamed banana cake was perfect–not overly sweet, soft and chewy. It was so scrumptious! My Mom generously shared the recipe with much instruction, guidance and love as is everything that she gives. Now I have the privilege of sharing this recipe with you. In honor of Mother’s Day, I hope you make this for your Mom or someone who is like a Mom to you to celebrate and cherish how special these ladies are in our lives. Enjoy! I like to use plantains because they have a mealy, starchy texture. The plantains must be ripe. You can tell a plantain is ripe by looking at the skin–it should have some black spots but not be completely black. Also, when pressing on the skin, the fruit should give but not be mushy. Green plantains take over a week to ripen, much longer than regular bananas. You can substitute plantains with regular (Cavendish) bananas or any type of banana you like if plantains are difficult to find in your area. They all work great in this recipe. Why do I smash the plantains? I find that smashing the plantains and then soaking in the batter improves the texture of the cake. Again we’re trying to achieve that balanced combination of a starchy and chewy cake. The yellow food coloring is optional but really helps to brighten the color of the cake. Be sure to steam the cakes on Low heat. Over-steaming will cause the cakes to swell and then deflate when they cool. I have 2 steamer trays and steam both cakes as once. If you don’t, just steam one at a time and check the cake for doneness after 15 minutes. Wrap a kitchen towel around the lid to absorb the moisture so it doesn’t drip onto the cake. Alternatively, wipe down the lid every 10 minutes. If using different size pans or molds, the steam times will vary. 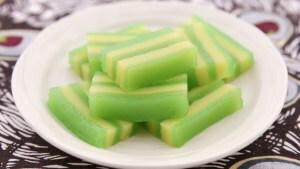 Generally, steam the cakes until they turn translucent and no longer wet. You can test by inserting a toothpick into the center. If the toothpick comes out clean the cake is done. When cooking the coconut sauce, be sure to stir every minute and scrap the bottom of the pan to prevent the tapioca pearls from sticking to it. This sauce needs to be cooked slowly and allowed to set-up and thicken. If you prefer a much thicker coconut sauce, reduce the water to 1/3 cup. You can always add more hot water later if you decide you want it saucier. Store any uneaten portions in the refrigerator. To reheat the cake, microwave on High for 15-20 seconds. To reheat the coconut sauce, stir in some hot water to loosen it up and then microwave on High for 30 seconds. In a large bowl, add the tapioca starch, rice flour, sugar, vanilla sugar, salt, warm water and food coloring. Whisk together combining all of the ingredients well. Take 3 of the 4 plantains, cut off the ends and remove the skin. Cut each plantain into 4 equal pieces. Using a plate, press down firmly on the plantain smashing it flat. Transfer the smashed plantain into the batter. Repeat until all plantain sections are smashed and transferred into the batter. Dunk the plantains into the batter and then stir the batter a few times. Let the batter rest for 30 minutes. Cut off the ends of the remaining plantain and remove the skin. Cut the plantain at a slight angle into slices about 1/8-inch thick. Generously coat two 9-inch round pans with non-stick cooking spray. Using a slotted spoon, transfer the plantains to the pans, dividing them evenly. Stir the batter a few times to remove any settling. Pour the batter into the pans, dividing it evenly between the two pans. 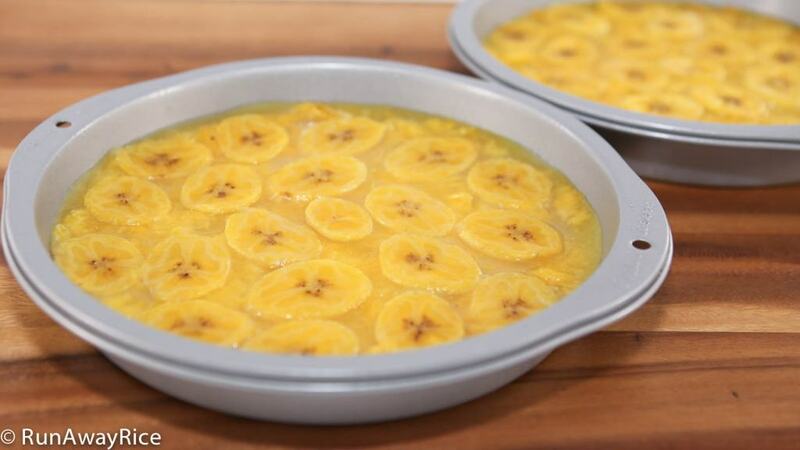 Top the cakes with the plantain slices. Bring the water in the steamer basin to a rapid boil. Reduce the heat to Low. Place both cakes into the steamer trays and steam for 20 minutes. Remove from steamer and allow to cool for 1 hour. 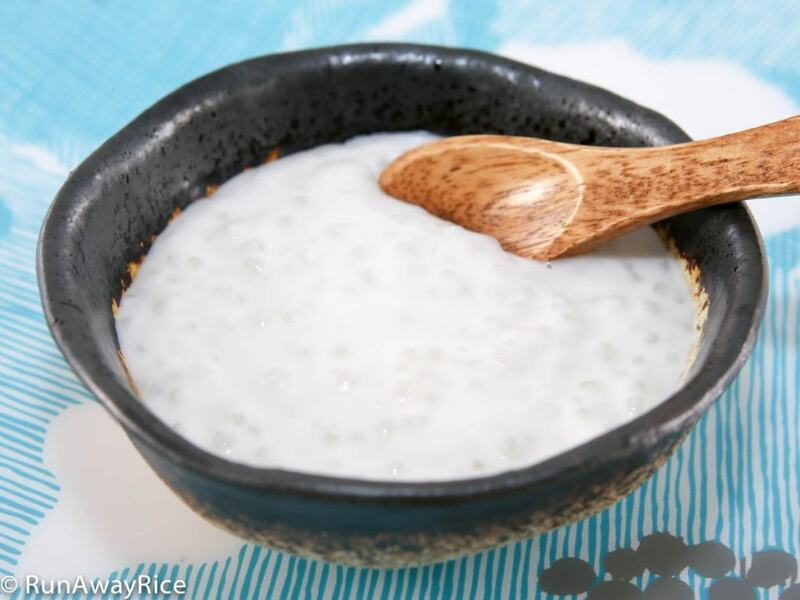 Soak the tapioca pearls in warm water for 5 minutes and then drain (discarding the water). Combine the rice flour with 1 Tbsp water and stir until smooth. In a saucepan, add the coconut milk, sugar, salt, water and rice flour mixture. Stir until the sugar is dissolved. Add the tapioca pearls and gently combine. Cook the sauce over Medium Low stirring every minute. As soon as the sauce starts to bubble, reduce the heat to Low. Cook the sauce for another 8 minutes making sure to stir every minute. Turn off the heat and allow the sauce to cool for 20 minutes. To serve, cut the cake into small pieces and arrange on a dessert plate. 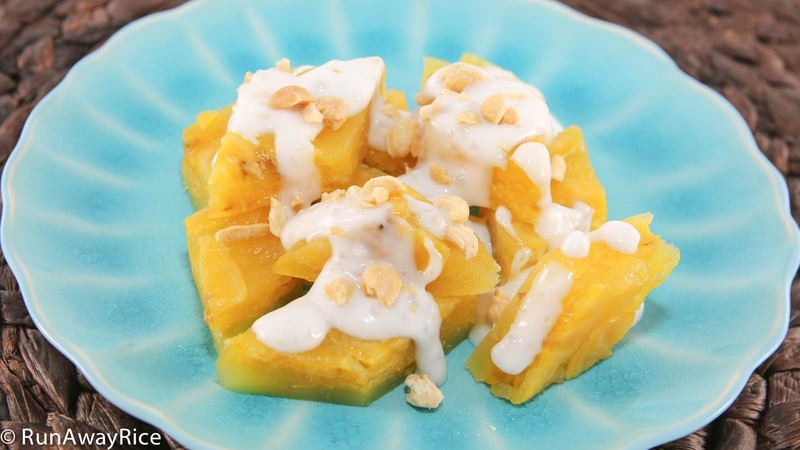 Top the Steamed Banana Cake with a generous amount of the creamy coconut sauce and crushed roasted peanuts. Enjoy! Is this possible to replace plantains with bananas? I’m so happy to find you! I’m Vietnamese but I don’t know how to cook. I really want to make Vietnamese dishes for my British bf because he loves them! Your recipes are brilliant! I can’t wait to try them once we reunite! You can use regular bananas instead of the plantains for this recipe. They are just as delicious. 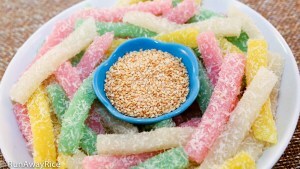 Hoping to make banh chuoi hap for my husband this weekend for his birthday! Just wondering—do you think I can replace the white sugar with coconut palm sugar? I received this coconut palm sugar from a friend in Cambodia as a gift and have been wondering how/what to use it for. Curious whether the coconut sugar will add some depth to this cake. Hi, Co Trang! You made steamed-banana cake is different from other Vietnamese cooks. The first time I see you mashed 1 whole banana after cut into 4 equal parts for the base, and then you pour over it with the batter and so on. But I like your way much better because more bananas adding. Oh, I checked with Amazon.com. They don’t have vanilla sugar packets. Do you know any where else I can buy them? Thank you very much I really enjoy your cooking and baking. hos long does this take to cook? Hi chi Trang, Did you weigh your plaintains with or without skin? It’s with the skin. A little more or a little less is ok. Enjoy the recipe! Hi. I was wondering what is vanilla sugar and does the rice flour have to be the same brand as yours or can i be any brand? Also, what type of steamer do you have? I am in the market for a good one. I cant wait to try this! Any brand of vanilla sugar and rice flour at your store should be just fine. I have a 2-tiered stainless steel steamer, the brand is “ES” and I bought at the Vietnamese grocery store in Southern California. If you’d like the store information, let me know. The steamer brand is “ES” 32 cm, purchased from Saigon Supermarket, Address: 10131 Westminster Ave, Garden Grove, CA 92843, Phone:(714) 636-5600. You can also try calling T&K Food Market. They’re a bigger store and may ship to Canada. Address: 9681 Bolsa Ave, Westminster, CA 92683 Phone:(714) 775-6678. Homemade vanilla is just fine, use 1/2 tsp + 2 tsp sugar to equal the vanilla sugar packet. Good Luck! I made this cake just last Thanksgiving weekend for some Jewish friends and it was a hit! Thank you very much!